Korea’s largest online polling site ipoll.kr conducted a poll for “Best Girl Group” from August 23rd to October 3rd. Various girl groups were paired up in brackets with the winner advancing to the next round. The poll was very popular with more than 100,000,000 votes tallied for the entirety of the poll. Despite being gone for quite some time it was surprising to see the Wonder Girls win the poll, Congratulations to them. Which girl group would’ve gotten your vote? 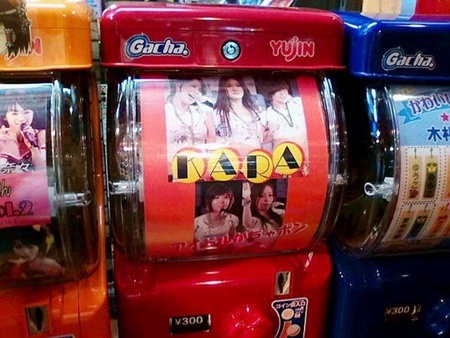 The rising popularity of KARA and SNSD in Japan was recently confirmed in an unusual manner, as the ladies were featured on special capsule vending machines for knickknacks and charms! Photos of the intriguing machines made their way onto an online community message board. 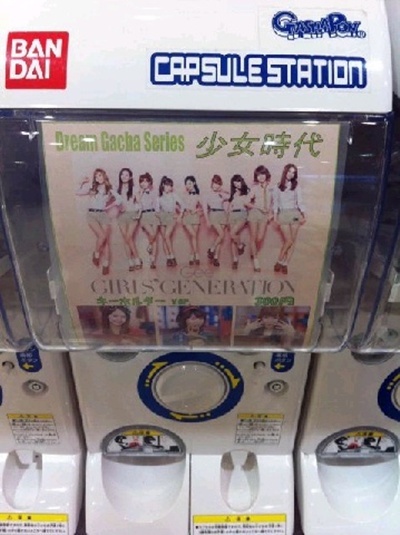 KARA and SNSD were found to be amongst vending machines featuring other highly-popular Japanese artists, thereby infering that the girls were establishing their place as top J-pop stars. If that wasn’t enough convince you of their wild popularity, the machines vended small capsules containing key chains made from the girls’ pictures. For the bargain price of ¥300 ($3.70 USD), Japanese fans can proudly carry around proof of their love forGoo Hara or Jessica. Would you be next in line to grab one?